At the turn of the century golf course design in the United States was in a nascent and mundane state. Building a new course was pretty much about staking holes in straight lines on flat terrain with a few hurdle hazards to make it challenging. Thankfully with the immigration of golf “professionals” from Scotland and England in the early 1900’s the strategic thoughts and concepts of course design from the links courses of the British Isles started to infiltrate the thinking as new courses were built to meet a fast growing interest in golf in the states. In his book “The Golden Age of Golf Design” journalist and author Geoff Shackelford catalogs the accomplishments of a new age of golf course architects that marked the most prolific and creative period of course design in the past century. Men like Charles Blair Macdonald, Seth Raynor, George Crump, George Thomas, Donald Ross, Hugh Wilson, William Flynn, A. W. Tillinghast, and Alister MacKenzie completely changed course construction introducing new and bolder routings, hazards, and green complexes to usher in a new strategic approach to course design. These guys and their associates were downright prolific-the number of courses in the U.S. expanded from around 700 in 1916 to over 5900 by 1930. They went on to produce some of the most memorable courses as well. As Shackelford points out a Golfweek list of the Top 100 American Courses opened before 1960 indicates that 84 of the top 100 were constructed between 1910 and 1937.
over a very short period of time. and a personal quote. He supports this with a trove of original black and white photos of the holes from some of our classic golf courses to give context to their conceptual elements. A wonderful accent to the book are the watercolor drawings of Mike Miller on the cover and at the beginning of each chapter of iconic holes from Merion, Los Angeles Country Club, Royal Country Down, Pine Valley, and Pebble Beach among others. The vivid renderings give the reader a surreal feeling for the character and design of these classic courses. Geoff’s book provides a synthesized understanding of the contributions of these designers and their influences on each other in setting a new standard for quality course design in the Golden Age. For an armchair course architect the book is a go-to reference manual that codifies the genealogy of the influential architects from the most significant age of American golf course design. Playing on the links at Royal Dornoch or Pacific Dunes or The Old Course you cannot help but understand that there is is a different type of golf you are asked to play. Links golf is played closer to the ground, emphasizing finesse and position, thoughtful approach and recovery. This style of golf in unique both in strategy and shot implementation. The lure of links golf is infectious to those who have experienced it and explains why so many of us will travel to obscure destinations to experience it again and again. The subtle question that almost never occurs to us when we are playing links golf is how much does the sandy soil itself account for the character of these courses and the style of play they dictate. 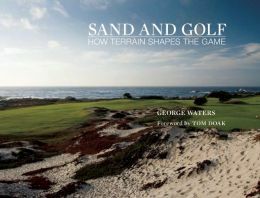 To George Waters, a course architect with plenty of credential from working on sandy soil terrain, this seemed a subject worth addressing in a book. He has worked on the construction or renovation of some of the best sandy soil courses in the world including Barnbougle Dunes in Australia, Sebonack in Long Island, The Renaissance Club in Scotland, and Pinehurst #2 in North Carolina. He spent considerable time working at Royal Dornoch as well as studying courses in the Sand Belt of Australia, Bandon Dunes in Oregon, the Sand Hills of Nebraska, and links courses throughout the British Isles. Water’s asserts that sandy soil gives these architects the optimal conditions for creative design. The rapidly draining turf allows them to maintain firm and fast conditions almost all the time. The natural depressions in fairways and greens can be employed in the design since they will not collect water creating troublesome soggy areas. Hearty long stemmed fescue and bent grasses thrive in this soil and can be kept closely cropped to allow for consistent firm and fast conditions. Nature’s evolutionary effect on the sand based topography creates an array of natural hazards the designer only needs to compose rather than create. Fierce and penal blow out bunkers are only a scratch of the surface away which allows more arbitrary location of the fairway bunkers. Existing grassy mounds and protrusions can be employed in the lines of play to force strategic choices that need to be carefully considered but depending on the day’s wind direction and intensity. Native grasses and low growth plantings can be used to shore up these natural hazards further erosion and give these hazards an aged, seamless character “blurring the edges between golf and nature”. Playing these courses we come to quickly understand that the irregular natural terrain and the ever present wind dictate a more grounded style of play. Mildly articulated washboard roll outs or heaving tempests of hummocks and hollows can lead to existential shot results. A strategy of play to minimize their effect must be respected. But these same topographical irregularities are an ally in controlling the pace of a ground approach to firm, contoured, and wind swept greens that may not abide an airborne approach. He talks at length about the green complexes on sandy soil courses being in sync with the topography. “Fairways relate to approaches, and approaches to greens, with continuity that is nearly impossible to achieve on other types of terrain.” Table top greens, greens with shoulder pads, punch bowl greens, greens with sweeping contours, and greens that just seem to be a natural extension of the fairway all are possible on this sandy soil base. With the challenge these complexes present green speeds do not have to be pushed to the maximum to challenge even the best players-this makes the course more playable and fun for players of all ability. If books like “Scotland-Where Golf Is Great”, “Emerald Gems-Links of Ireland”, “Links Golf” by Paul Daley and “Grounds For Golf” already adorn your personal golf library, “Sand and Golf” will find a comfortable spot right beside them. Two former editors of golf magazines of substance have put together ‘True Links’ an illustrated guide to the 246 Links golf courses in the world. Much in the vein of Larry Lambrecht’s ‘Emerald Gems’ and James Finegan’s ‘Scotland-Where Golf Is Great’ this is a thoughtful presentation of photos and supporting research on the links courses that define the game of golf. George Peper, a former editor of Golf Magazine, and Malcolm Campbell, a former editor of Golf Monthly, bring their expertise to the task of defining and documenting the active links courses around the world. Augmented by the vivid photography of Iain Lowe and other supporting photographers this book brings to life the grandeur of links courses from the British Isles and around the world and puts their individual stories in the context of the evolution of golf over the centuries. If you asked the greatest players who ever played the game where they would prefer to play every day links courses like The Old Course at St. Andrews, Royal Country Down, Muirfield, and Ballybunion would come to their lips. The style of golf these courses demand bring out the deep seated talents of all players so the satisfaction of playing them well is very special. Tom Watson, arguably one of the most successful players in Open Championships contested on links courses, slowly came to accept and embrace the demands of links golf. He describes what he discovered, “Don’t fight it…enjoy it. Solve the puzzle……Calculating the wind, allowing for the firm terrain, trusting your judgment and feel…that is the joy of playing a links. You need almost a sixth sense, an ability to adjust to all the conditions and somehow get your ball to travel the proper distance-whether through the air or along the ground. That is the essence of links golf. But the links giveth and the links taketh away. It can be cruel and beautiful in the same round, occasionally on the same hole, and once in a while on the same shot. When you figure out all the equations properly and the shot comes off as intended, nothing is more satisfying.” I have a feeling Phil has come to share this sentiment recently. True Links begins by defining what distinguishes under 250 of the courses in the world as Links courses. The British Golf Museum in St. Andrews defines linksland as “a stretch of land near the coast…characterized by undulating terrain, often associated with dunes, infertile sandy soil, and indigeneous grasses as marram, sea lyme, and the fescues and bents which, when properly managed, produce the fine textured tight turf for which links are famed.” Add to this the quirky and sudden changes of wind and rain that seaside venues present and you have a chess game on grass against the elements and the higher order who choreographs them. The result of this requirement of turf, terrain, and weather is that many of the most familiar and storied seaside courses are left off of the list of Links courses. Pebble Beach, Cypress Point, Royal Melbourne, Whistling Straits, Shinnecock Hills, and The Ocean Course at Kiawah are spectacular and challenging venues we equate with links golf but they lack either the firm sandy turf, the associated dunes, or the close proximity to the sea that strictly defines a links course and the brand of low to the ground golf associated with them. The authors pay homage to the great architects that drew links courses out of the unique terrain nature presented in the British Isles. From Old Tom Morris to Harry Colt, James Braid, C.B. MacDonald, Alistar MacKenzie, Donald Ross, and A.W. Tillinghast they show the linkage of thought and design the great architects made studying the challenges of links courses and how they incorporated them into what would become the classic courses of the Golden Age of Course Architecture. This respect for links design feature continues to be seen in the contemporary work of Pete Dye, Tom Doak, Ben Crenshaw, Bill Coore and others in places like Whistling Straits, Bandon Dunes, Sand Hills, and Cabot Links. The Crucible is a chapter dedicated to the grand daddy of them all, The Old Course at St. Andrews. Tracing it back to days of shepherds hitting rocks with their herding staffs, through Royal edicts against playing, to Rabbit Wars for the land’s usage, we get a sense of how the game evolved. Rules, equipment, course construction and maintenance were forged over centuries throughout Scotland. The standard of the number of holes, the routing, the cup, the ball, and all the rest came from trial and error and the guiding will of a series of individuals who sought to regiment and standardize the game they were playing. What follows is a chapter called The Icons which gives vibrant imagery and context to the 25 links courses that have defined the game. Quirky courses-Lahinch and Ballybunion, original classics-Prestwick, North Berwick, and Rye, the full array of Royals-Aberdeen, Birkdale, St. Georges and Portrush , and the mysticals- Royal Dornoch and Royal County Down come to life as the authors explain the developmental history and unique characters of these pioneering links. The Classics are the next level spawned by the Icons-they are the broader inventory we have come to know as links courses. Many are familiar, Machrihanish, Lundin Links, Waterville, Country Sligo, and St. Andrews Jubilee. Others less so The Island, Enniscronne, Gullane, Aberdovey, and Ballyliffen. From there they go to The Exotics covering the links courses outside the British Isles in The Neatherlands, Germany, New Zealand, Australia, and South Africa. The journey ends with The Moderns, links courses that have come on line in the last forty years and reinvigorated the interest of golfers in the true tradition of the game. New entries in Ireland-Tralee, Doonbeg, and The European Club, Scotland-Kingsbarns, Castle Stuart, and Trump International, and North America-Bandon Dunes, Pacific Dunes, Old MacDonald, and Cabot Links are testimony that the influence of links golf design on the pleasure and enjoyment of golf continues. Peper and Campbell argue that the future of golf remains in the hands of this movement. The demands of environmental responsibility and financial viability in developing new courses once again directs the architect’s attention to the minimalist approach to designing and maintaining a links course. Jim Arthur, an agronomist and promoter of natural links in Scotland put this way. “Lack of money has always been a great limiting influence on the making of mistakes. The poorest clubs have the best courses…in greenskeeping one should ask a farmer what to do and then go and do exactly the opposite.” The coast of Oregon and Nova Scotia, the sand hills of Nebraska, and down under in Tasmania Australia credence has been paid to this notion with fine result. 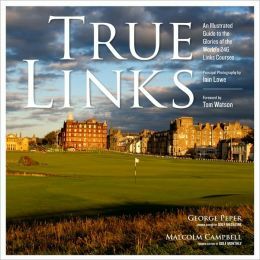 For an understanding of the place of links courses in the historical time line of golf, simple reminiscence of the places one has played, or in developing a bucket list of what is yet to come, True Links is a book that should have a place on your library shelf. This is a book you will reach for on a regular basis. You ever sit around after playing a wonderful golf course for the first time wondering how cool it would be to play this gem with the course designer so you could understand what was going through his mind. Well if that course was Old Macdonald at Bandon Dunes then your wish has come true. With the considerable filmmaking skills at work of Los Angeles producer Michael Robin, the DVD “A Journey to Golf’s Past: Creating Old Macdonald” is packed with intimate goodies on the conception, planning, and creation of the latest links offering at Mike Keiser’s Bandon Dunes resort. For the golf junkie and armchair course architect this is like manna from heaven. Old Macdonald was the brain child of Mike Keiser who wanted to build a little bit of Scotland in America and honor the genius of C.B. Macdonald the father of golf architecture in America. With the help of the foremost American expert in links design Tom Doak and his valued associate Jim Urbina they set about gathering characteristics of holes that C.B. had done through his career and composed the best of them into the glistening collection holes that make up Old Macdonald. The feature presentation is over an hour of interviews with all the protagonists of the project covering the processes of planning, design, and execution of the course construction. 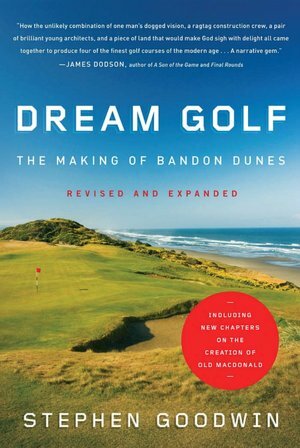 The interviews with Mike Keiser give you real insight into his thinking as he has stewarded ambitious golf projects like Bandon Dunes. It also includes vivid footage of the holes at Old Macdonald as well as their counterparts at St. Andrews, North Berwick, Prestwick, Yale Golf Course, and The National Golf Links. Doak walks through the characteristics of the original holes at these venues and his interpretation of them in the new holes in Bandon. There is also detail about construction challenges and techniques when it comes to building a links golf course. Whether it is hand raking fairways to get them just right, feathering the final contours of the massive greens, or building a sod wall bunker one row at a time this is fascinating to watch. As is the case with all these DVDs there are some extras to add value to your purchase in the form of “special features”. The coolest extra is a hole-by-hole tour of the 18 at Old Mac with Tom Doak as your guide. This is like having a video yardage book with the designer as narrator. If you have played the course you will find this feature very enlightening. For ten bucks plus shipping you can find this DVD on the shopping portal of the Bandon Dunes website. The quality of Robin’s video and production along with the ethereal Scottish sound track by Mason Daring make for a very enjoyable and informative walk through the creation of Old Macdonald. This book is subtitled “The History and Fundamentals of Golf Course Design” and that is an accurate description of what it is about. Fundamentals, not the wonky details, of course design is what Shackelford successfully relates to the arm chair course architects out there. You know who you are. Guys who regularly are moving bunkers or rerouting the front and back nine on their home courses over clam chowder after an above handicap performance and a loss of two out of three on the morning Nassaus. Or guys who come back from that man trip with a litany of “suggestions” on how those name brand architects could have made the courses just a tinch more playable. 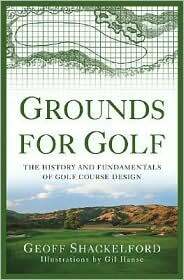 This is an informative and very readable primer on golf course design and the history that has brought us to where we are today. Shackelford is a bright guy with an easy going writing style who is well briefed in the subject and opinionated enough to make it thought provoking. He is a guy who has played all the holes he discusses and has done the necessary background research as well. The book is full of thoughtful quotes from C.B. Macdonald, Alister MacKenzie, Ben Crenshaw, Tom Doak, Pete and Alice Dye, among other design authorities that lend credibility to his opinions on the history of the development of course design. Add to this the etchings of Gil Hanse, a fine course designer in his own right, and it is a well presented and balanced presentation on a subject that too often is discussed vociferously without adequate background knowledge. The book is compartmentalized by subject to cover what is architecture, schools of design, evolution of the craft, principles of design, great holes and classic designs, and even the nomenclature of the industry. His two chapters on Comic Relief in quality design and the role of Temptation as a key element in challenging players to make quality decisions that will affect their scorecards are particularly interesting. Shackelford has the distinction of having dabbled in design as a consultant on a track not far from Los Angeles called Rustic Canyon that he did under the tutelage of Gil Hanse and Jim Wagner. This is a natural looking daily fee course they created in the rugged foothills of Southern California and it avails him the opportunity to explain many of his theories of design as expressed through their own experience in creating this course. The print version is accessible for a steep price in the used market but you can get the Nook electronic version for about $7.99 through the internet. This book is not for everyone, you need a bias of interest in the topic to wade through the detail he presents. If you are an armchair architecture wonk like me this is something you need to have read if for no other reason than to have some basis for your personal authority when criticizing the Pete Dye design that just ate your lunch. Dream Golf is required reading if you are going to play this new west coast mecca of American golf. Stephen Goodwin writes a detailed account of the conception, planning, construction, and operation of Mike Keiser idyllic contribution to the inventory of American golf destinations. Goodwin’s access to Keiser, David Kidd, Tom Doak, Bill Coore, Ben Crenshaw and so many other protaganists who were instrumental in this exercise make this an informative read. To dream of bringing true links golf to America was an audacious ambition on it’s own. But Keiser, a wealthy entrepreneur from his success building Recycled Paper Greetings, took this a whole step further. He saw himself as the George Crump of our time-the man who in 1913 conceived and funded the building of the most famous golf course in America Pine Valley on obscure sandy scrub hills outside of Camden, New Jersey. To this end Keiser not only conceived of the idea he went through the painstaking process of becoming an expert in links golf by assiduously playing all the greatest links venues in the world and tirelessly networked with architects and experts on the subject. Using his own money and connections he searched for just the right raw venue that could be a home to his dream until he landed on this remote site in southern Oregon. The book documents Keiser’s immersion in the process and his entrepreneurial risk taking it took to bring it to fruition. He landed the best young architects of our time before they were famous and full of themselves. As a result he pushed them on to create something very unique-real links golf courses on American soil. David Kidd-a young Scotsman-did the first course Bandon Dunes in the late 1990s. Tom Doak, one of the truly knowledgeable people when it comes to traditional links course design, did Pacific Dunes next in 2001. Bandon Trails was the work in 2005 of Bill Coore and Ben Crenshaw who had to negotiate the blending of more rugged inland terrain with the desired seaside features. Tom Doak came back in 2010 to create Old Macdonald a testimonial course to the pioneering influence of C.B. Macdonald considered by many to be the grandfather of American golf course architecture. This book provides marvelous insight into the planning of golf courses and the special challenge of bringing authentic links design features to an American seaside venue. The detail of conversations and the evolved thinking that brought these courses-all of which are in the top 100 in America by the magazine rating listings-to reality makes this a rich and engaging read. The bonus is that for each course the author played a round with the designer and Goodwin gives a hole-by-hole account of the experience. This is like getting a course guide written by the architect as a primer before playing the course. Very cool indeed. I highly recommend this read whether you are going to Bandon Dunes or not. If you are going to Bandon it will provide unique insight to the facility and the guys who created and still run the place. If not you will just become much more knowledgeable about the Herculean effort it takes to create a storied venue.